AQUILA the Eagle is a constellation studded with lots of planetary nebulae and a few star clusters. 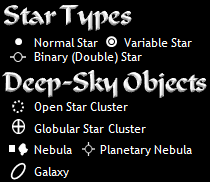 The brightest star is Altair; since it has a magnitude that is less than 1 it is very bright. 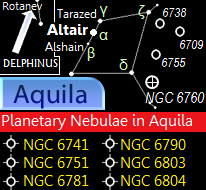 Aquila borders Delphinus (the Dolphin), Hercules, Ophiuchus (the Serpent Carrier), Sagitta (the Arrow), and Scutum (the Shield). Now you know more about Aquila!